The captain of this brave and bumbling pirate crew has ordered them to capture the entire alphabet–and they’ll walk the plank if they’re missing a single letter! These swashbuckling mateys embark on an alphabet adventure unlike any other, and they won’t (ahem, can’t) rest until they’ve found an A, a Z, and everything in between. Kindergarten-Grade 2–These animal pirates decide that they need more than the letter R (R’s not enough./We need other letters/to help make us tough), so they set off to find the remaining 25. Led by a crocodile captain (with a hook, no less), the band of buccaneers search far and wide to complete their mission. Some letters are found near items that begin with that letter, e.g., an anchor, gold, or a parrot. Others are in situations that involve the letter in action–Q is questioned, U is underwater. Still others are described, as in the case of the nimble N. Some alphabet books struggle to incorporate X, but as any young pirate knows, X marks the spot on a treasure map. The rhyming text is more suited to reading aloud as it includes a number of words that would have beginning readers asking for assistance. The colorful cartoon illustrations encourage children to participate by finding the sought-after letters, which appear in bright red uppercase in each scene. This alphabet adventure is sure to capture audience attention at a pirate-themed story hour, and will be enjoyed by individual borrowers. 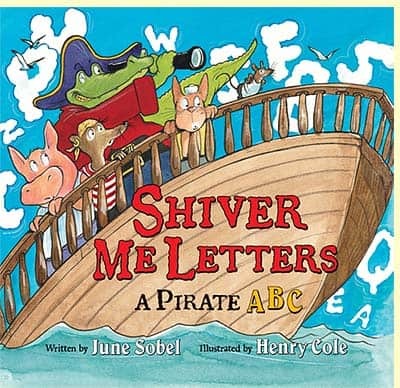 Those looking for an “M is for Matey” type of treatment will have to plunder elsewhere, as Sobel’s (B Is for Bulldozer: A Construction ABC ) alphabet does its playful swashbuckling in a slightly less traditional manner. True enough, Sobel’s bossy pirate captain (depicted as an alligator wearing a rubber-ducky inner-tube around his waist) sets the seafaring adventure afloat when he roars quasi pirate-speak from the deck, “‘R’s not enough./ We need other letters/ to make us tough.’/ ‘Let’s sail far away/ to find ABC’s. 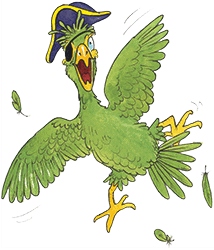 '” A motley, if enthusiastic crew of yellow-toothed animal buccaneers rallies to his cry for a treasure hunt, chronicled in the jaunty rhyming story on the subsequent pages. “The anchor went into an A !/ A B floated by on the crystal clear bay.” Young readers will find plenty of maritime and pirate-centric booty, including doubloons, hook, landlubber, yo-ho-ho-ho, and certainly X marking a special spot as they spy each letter printed in a bold red typeface. Cole’s (Dinorella) rollicking, sweetly comic watercolors capture typically imagined details from a pirate band—deck swabbing, a tyrannical leader, walking the plank. And Sobel’s action-filled story line gives the artist lots of leeway to be creative with other funny bits, too. Ahoy! A nifty concept book. Ages 2-5. Don’t forget to celebrate International Talk Like A Pirate Day on September 19th. 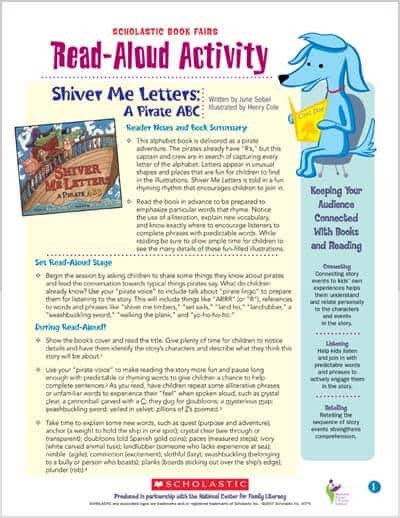 Shiver Me Letters is the perfect read-a-loud for that event. This teacher’s guide from Scholastic offers lots of great ideas for pirate themed classroom activities. Click on the image to download the PDF.